Douglas Gray spends most of his time thinking up intricate ways to kill the characters of those brave enough to join his D&D games. In his spare time he paints cigar boxes for gaming uses (which can be found at 20sideup.tumblr.com), and hangs out with Paisley and their dogs Myfanwy and Nimona. What begins as a simple animal rights demonstration leads to a stolen experiment and a conspiracy that may not only bring down the US Government, but destroy civilization as we know it! "Mr. President? We have... a situation." With that simple statement, the President and his advisors found themselves whisked away to a secure location. Their goal: To find a solution to a biological outbreak that could overtake the country. And to do so without anyone knowing how close humanity has come to the brink. 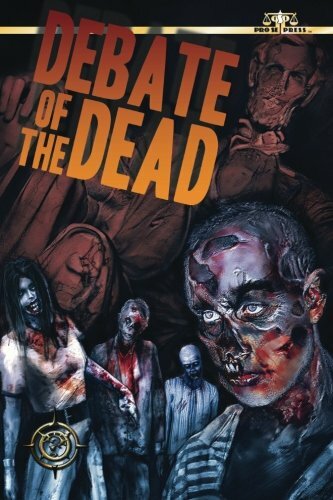 This is…The Debate of the Dead. The game made popular at conventions by its creators, lost gamers productions, is now a collection of riveting tales from Pro Se Productions.